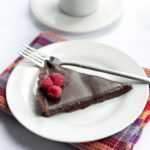 This recipe for Dark Chocolate Silk Tart makes a creamy, rich, decadent dessert that is a dream come true for any chocolate lover! Cream butter and sugar together. Stir in eggs and yolks, adding one at a time. Sift together flour, cocoa and salt and add to butter mixture. Mix until dough just comes together. Shape in to a ball and chill 20 minutes. On a lightly floured surface knead the dough slightly to soften a bit and then roll it out to just over 1/4-inch thickness. Line an 8-inch removable-bottom tart shell with the dough, trim the edges and chill for another 20 minutes. Prick the pastry with a fork and bake for 18-20 minutes. Allow to cool. Place the chopped chocolate in a large heat-proof bowl. Heat cream to just a simmer and pour it over chocolate. Let it sit for a moment and then stir slowly to melt the chocolate. Stir in the vanilla and mix until smooth. Pour the filling into crust and cool at room temperature for 15 minutes and then chill in the refrigerator for 2 hours before serving.